Thirteenth Spot - Note some people also put a tilak on the tuft (hair) and it is dedicated to Vasudeva. If tilak is applied on hair tuft then the person should chant Om Vasudevaya Namah. This method of wearing chandan is strictly followed by Vaishnava devotees. 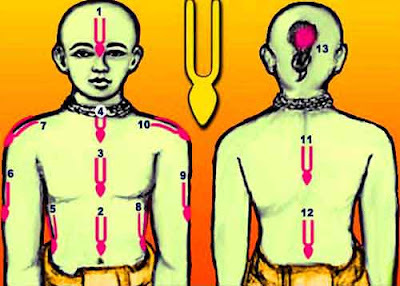 Normal Hindus usually apply tilak on forehead and on throat. The tilak applied by Hindus daily is a straight line or a dot. There are no strict rules as to wearing tilak on body parts. It is left to the devotee to decide.